Tributes are being paid in Liverpool to mark the 30th anniversary of the Hillsborough disaster. A minute's silence was impeccably observed on Sunday at Anfield before Liverpool's match with Chelsea in the Premier League, in memory of the tragedy on April 15, 1989, which claimed the lives of 96 people. On Monday, a minute's silence will be held in Liverpool at 3.06pm - when the match was halted - after an afternoon service at the Anglican Cathedral at 2.45pm. 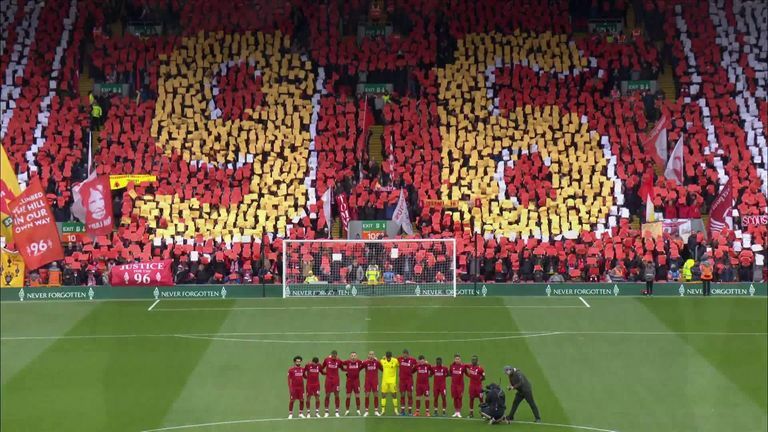 On Sunday, supporters in both the Kop and the Sir Kenny Dalglish Stand revealed special '96' and '30 years' mosaics, while both teams wore black armbands as a mark of respect as Liverpool beat Chelsea 2-0. Tributes were also displayed on LED boards surrounding the pitch, the day before the 30th anniversary of the disaster. Liverpool manager Jurgen Klopp paid tribute to those affected in his pre-match programme notes. "Anyone who reads these notes regularly will know that my starting point is usually the game of the day. This often makes absolute sense, of course, but today it does not," he said. "Today is a day when the first thought of everyone connected with Liverpool will be commemorating the 30th anniversary of Hillsborough and showing our support for the families of those who died and the survivors who continue to deal with their experience. "Parents losing children, children losing parents, brothers and sisters losing siblings, friends losing friends; we know this is part of life, but we do not associate it with going to a football match to support your team. Even now, that doesn't make sense. "As a club we have an obligation to ensure that we do everything we can to ensure that the players understand why it will always matter so much and why it is central to who we are, what we do and who we represent." Before the match, Chelsea boss Maurizio Sarri urged his team's supporters to respect Liverpool's tributes to the Hillsborough victims.